Notice: Since this post was published Chromatik.com changed from a sheet music site to a forwarded link to another music site. Disney piano sheet music is no longer offered. 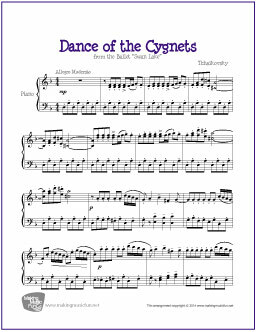 Chromatik.com offers a free download to new visitors, so it’s a great chance to see what they’ve got and get a free piece of sheet music. If you like Disney songs they’ve have them for easy piano and a more advanced level. It’s one of the few chances you have to get legal versions of Disney songs as a free download. Below are a few of the Disney movies for which they have free sheet music piano arrangements. Just browse their site, pick out the piece you like and download it. Here’s a piece for easy/intermediate piano students. Interested in reading a little about the piece? I’ve included an excerpt from Wikipedia below, and a link so you can read more on the site. If you enjoy the music of Tchaikovsky, and have been playing the piano for a few years, this arrangement of this piece from Swan Lake will present a wonderful challenge. Here’s a printable resources for piano teachers and students that you’re sure to excited about – a best of Mozart Piano Book. This digital print book is an assortment of Mozart’s works, including arrangements of many of his most popular pieces for piano and orchestra.